Functionality with options! 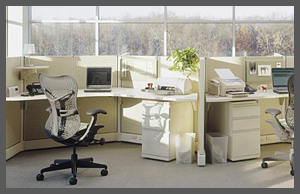 We offer desks/case goods in most any shape, size or configuration to meet your space and budget requirements. 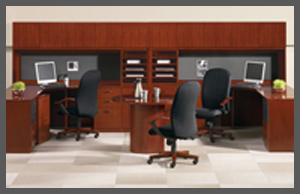 We provide both laminate and veneer choices as well as custom desks if that’s what you need. Our manufacturers such as Indiana Furniture, Cherryman Industries, Mayline, to name a few, offer myriad of styles and wood finishes to meet your design criteria. 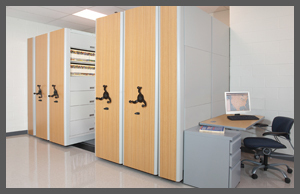 We can design a new workstation project, add to your current configuration or simply move what you have..we do it all. 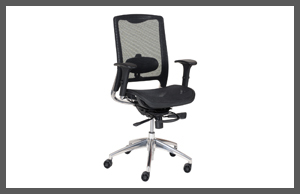 We offer remanufactured Herman Miller and Steelcase systems as well as new Trendway, Compatico or Tekna workstations. Your choices for fabric and paint are almost limitless. Seating comes in all shapes, colors and sizes. Where do you begin to choose what’s right for you? We start with assessing your needs, then knowing our product lines, can narrow down the options to best meet your needs. We can even bring chairs to you to “test drive” for several days. 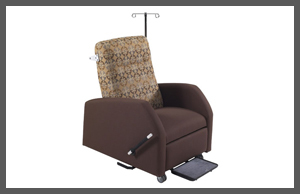 From ergonomic chairs, stools, lobby furnishings, outdoor chairs, if there’s a chair you have in mind, we can get it. First impressions are important for your guests so the lobby should reflect the ambiance you’re looking for. 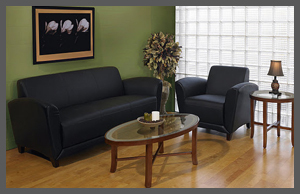 We provide many options from couches and club chairs to single guest chairs, settees and gang seating. We also provide many options for tables, from wood tables to glass tables in many shapes and sizes. If you’re looking for a reception station, please see our Desk Product Section. To furnish those larger spaces where groups gather, look no further. 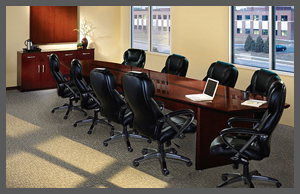 Conference rooms, training rooms, break rooms are no problem for us. 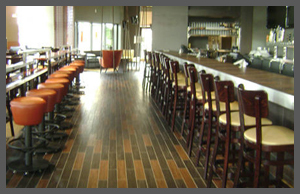 We offer many options depending on the style and requirements for the space. We also provide accessories such as buffet tables, beverage carts, podiums and presentation boards to name a few. As always, will provide a floor plan to ensure the most efficient use of space. When you pay per square foot for your space, you want to get the most for your money. We’ve been working in this area for over 25 years and know the right product to meet your space requirements. It doesn’t matter if it’s an entire warehouse, a small storage room or just some filing cabinets. We offer products from Datum, Richards Wilcox and Western Pacific to name a few. We will assess your needs, measure your space, complete floor plans and recommend the best product for your needs. It’s the nature of the beast..in the restaurant business or even your break room, your tables and chairs must have a combination of durability and comfort. We have multiple hospitality lines that provide quality products from high end to more affordable. Just let us know your budget and the look you want to achieve. All our lines carry many fabric and finish options as well as extended warranties. When you sit and/or work on a computer for long periods of time you have special needs to ensure your well being. If your equipment is not ergonomically correct sooner or later there are physical consequences. 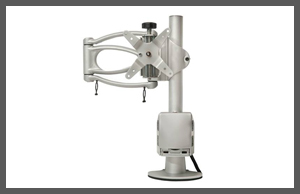 With our knowledge of ergonomics and the equipment we provide, there is no need to worry. We can assess individuals needs and recommend the right product to ensure your employees are healthy and happy. We offer a variety of stools, day beds and chairs.